Are you looking for a tasty snack to have at work? Look no further than almonds. They’re delicious and require no prep time. Plus, there are numerous health benefits of almonds. One serving of almonds is a 1/4 of a cup or 23 almonds or a simple handful (depending on how you prefer to measure). One serving of almonds can greatly impact your health. Listed below are five Mindful health benefits of almonds. Increase your calcium intake. One serving of almonds has seven percent of your recommended daily calcium as well a high dose of magnesium, which helps your body use the calcium more efficiently. Stay full. One serving of almonds gives you as much protein as an egg (if not more). So, when you get the afternoon munchies, reach for some almonds. It contains up to 12 percent of your daily protein needs. Stay slim. Studies show that people who eat two servings of almonds at least twice a week are less likely to gain weight. However, almonds are high in calories so be sure to keep your servings to less than 1/3 a cup. Almonds covered in sugar are cheating and do not count as good for you. Stay energized. 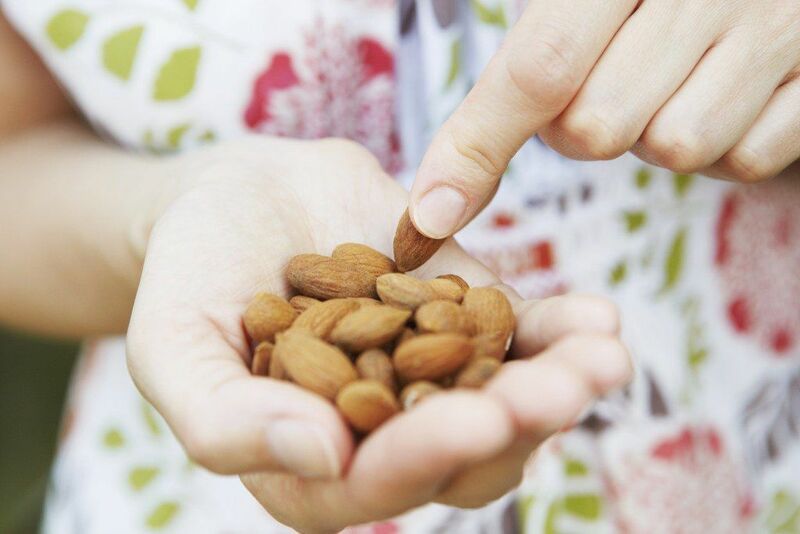 A handful of almonds is can also give you energy. This is because it’s full of vitamin E and magnesium. It’s also full of fiber that can regulate sugar and your energy. So, a handful of almonds can literally be a burst of energy. Keep your heart health. Almonds are full of good fats, which can help lower cholesterol. Adding almonds to a low-fat diet can help lower your cholesterol by almost 50%. However, be sure to get nuts with little to no salt or you will negate the benefits. Mindful Bonus. Eating almonds isn’t the only way to gain the health benefits that these nuts have to offer. Consider massage drops of almond oil into your scalp, letting it sit for 15 minutes, and rinsing. Almond oil helps hydrates skin, cleanse pores, and repairs damaged hair. You can also use almonds for your skin. Vitamin E, which is found in almonds, can help fight the effects of environmental pollutants and the sun on the skin.